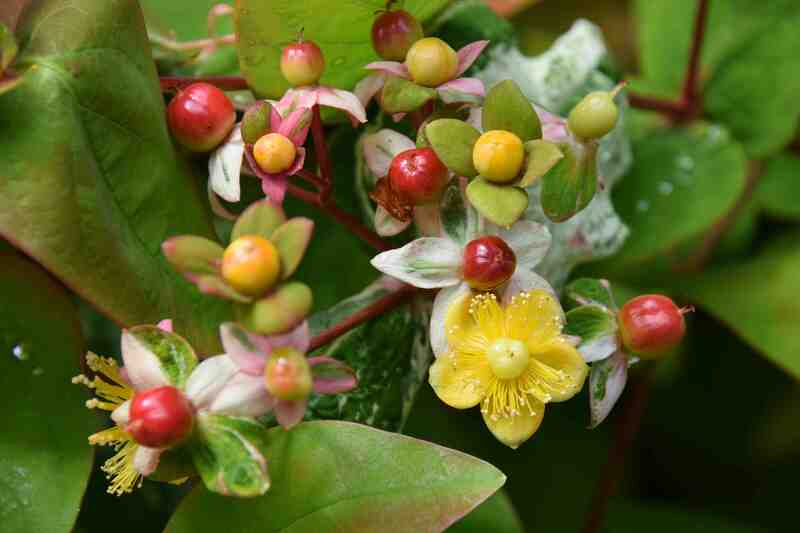 I have never been overly fond of hypericums. Trying to put some sort of reasoning to my illogical dislike I think the main reason is that, with one exception I know of, the flowers are stubbornly all the same colour. And not just all yellow but the same shade. There can’t be many genera that have not produced an albino form from time to time but it seems that hypericums have proved incapable of producing an ‘Album’ in any species. See, I am very reasonable and I am not asking for an orange or a red hypericum, just something subtle to alleviate the monotony. The flowers themselves are very pretty, with their five petals and curiously neat stamens and the fruits are usually berries that can be many shades but typically red before they turn to black. But then there is rust. Not every hypericum gets rust but the common (well once common) H. calycinum that used to be planted extensively for ground cover on banks, and the native tutsan (H. androsaemum) both get clobbered by rust and then look awful. 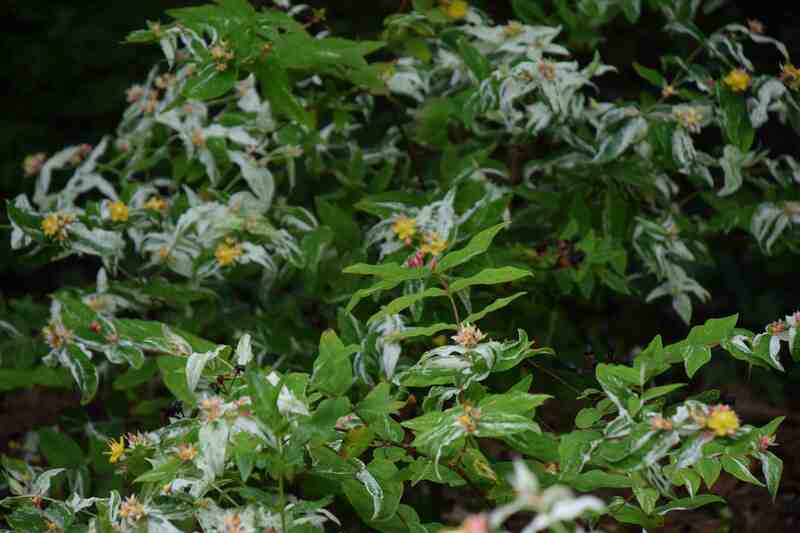 My relationship with tutsan goes back a long way and I noticed it as a child and was fascinated by the neat flowers, red berries and the fact that it was also called bible leaf because the fragrant leaves were used as bookmarks in bibles. But I digress. Common tutsan is hardly worth growing in the garden, though it could be allowed in a wild area, but there is a purple-leaved ‘Albury Purple’ and a yellow-leaved form that might tickle your fancy. One that I have never been keen on is ‘Gladys Brabazon’. I have no idea who she was or is but (no offence intended) if she chose this plant to be named after her I suspect she had crocheted poodle toilet roll covers and stole all the rose and strawberry creams from the chocolate box. 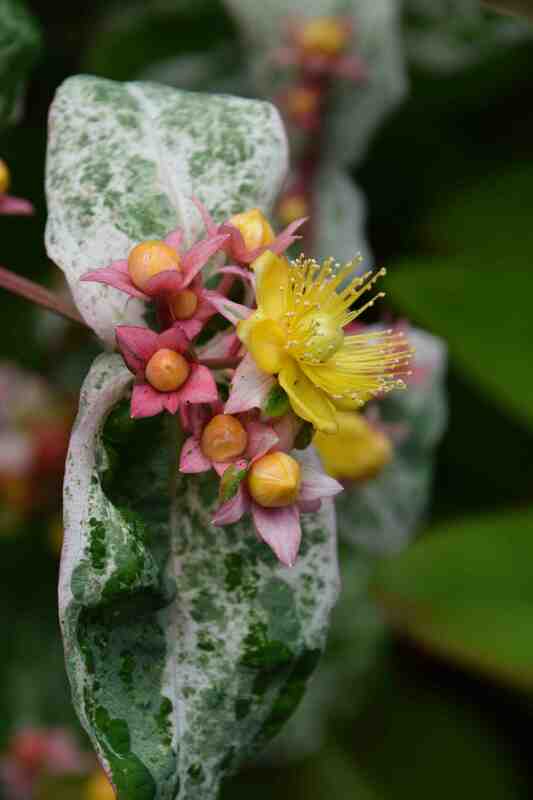 Not only is this a hypericum but it is variegated in my least favourite way. 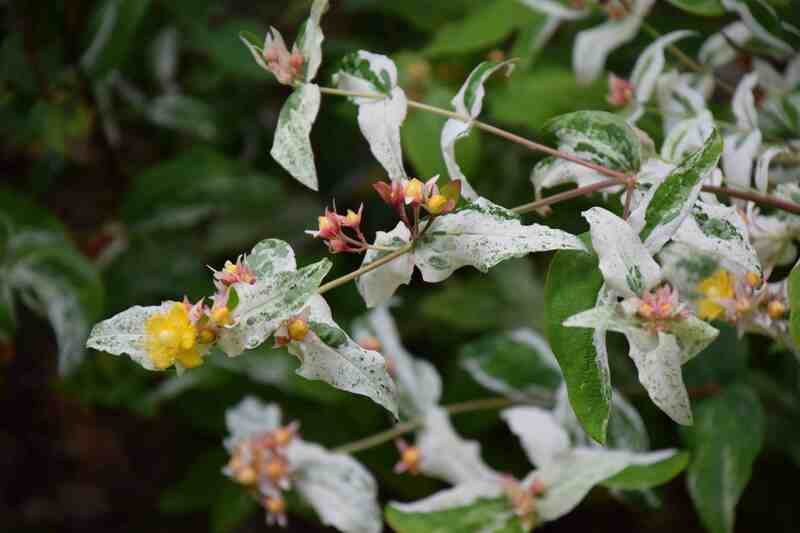 The leaves are usually distorted and narrow if there is a large area of variegation and the irregular splashing of white with tinges of pink, might make you suspect there is a bird nest aloft. And then the yellow flowers are highlighted by pink flashes in the calyx – my least favourite colour combination! But. Here is a shrub that can be grown from seed and a large proportion will breed true. It grows rapidly and can be hard pruned in spring and reaches about 70cm high, thriving in sun or part shade. It grows best and will be less likely to suffer from rust if it is grown in light shade and if the soil does not dry out to much in summer. And although I ought to hate the look of it I can’t deny that it is a bright little thing in a dolly mixtures sort of way. If you think it looks fab then please plant it and then I can come and look at it in your border and can get my fix without having to give it room in my own plot! ‘Dolly mixtures’ captures the look just perfectly. Not a big Hypericum fan either, but I always seem to have one somewhere in any garden I’ve owned (plus the rust of course). Thanks for that! My feelings often alter when I see a well grown ‘Hidcote’ and H. proliferum is quite cute. I would neverquite ban them from the garden unlike bedding begonias!